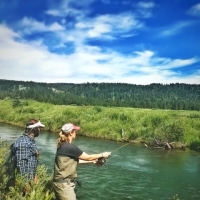 Our expert staff and guides are ready to make your experience exceptional and help you get the most out of our many Green and White Season adventures that will inspire and indulge, including horseback riding, fly fishing, personalized Grand Teton and Yellowstone tours, Nordic skiing, snowmobiling and fat biking. With picturesque views fit for an Ansel Adams catalog and luxurious private accommodations, adventure awaits you at Turpin Meadow Ranch. 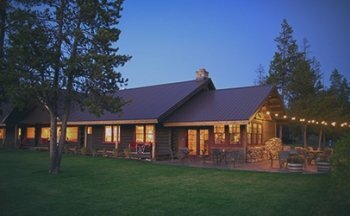 The cabins and chalets at Turpin Meadow Ranch boast full frontal views of Grand Teton National Park and embody the true nature of the wilderness without compromising your comfort. These sophisticated accommodations have been revitalized with upgraded amenities, feature gas-lit fireplaces, custom handmade furniture and Pendleton blankets. All guests have easy access to a friendly bar and farm-to-table dining restaurant as well as the nearby Buffalo Fork River, which can be enjoyed from cozy cabin porches. Stunning rustic design meets modern features and sumptuous Western decor in our two new beautifully crafted chalets. Each is designed to offer several breakout configurations to meet the needs of individual guests, couples, small families and large groups with one, two or entire Chalets options available. On the banks of the Buffalo Fork River and recently remodeled, our cabins are the perfect setting to unwind after a day filled with adventure. 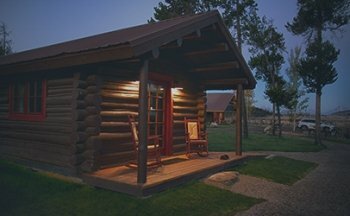 Our cabins are furnished with luxury amenities to pair perfectly with the ruggedness of our Wyoming surroundings. 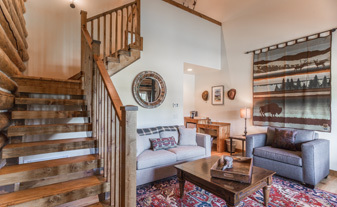 Each cabin features locally designed furniture, Pendleton blankets and gas-lit fireplaces. The main lodge at Turpin Meadow Ranch features historic log beams and the original refinished wood floors. The lodge is also a piece of history that will revitalize your spirit with its genuine Western charm and sophisticated decor. Sit by the fireplace, relax on the front porch or belly up to the bar and be treated to breathtaking views of Grand Teton National Park. The summer holds an abundance of Jackson Hole activities and adventures to enjoy. Spring is the best time to see newborn wildlife and be immersed in the tranquility of the mountains. Summer is the best time to visit Yellowstone National Park and Grand Teton National Park. Or come in fall, when the colors start changing, the elk start bugling and the first snows dust the mountaintops. This winter, retreat to Turpin Meadow Ranch, the best choice in Wyoming Nordic ski resorts, with access to 15 km of groomed Nordic ski track, among other exciting activities. From back-country skiing to fat biking and beyond, there are so many Jackson Hole winter activities to enjoy at the ranch while staying in our warm luxury cabins on the banks of the Buffalo Fork River. Explore some of our favorite activities.